It's important that your efforts to land a salmon are fulfilled after being successful with the tact required to make contact with one. There's a great deal of nonsense that's been spoken about exactly how to play a salmon so I'm going to explain clearly and logically how you should engineer the successful playing of a fish over the next few paragraphs. Once your salmon has been properly hooked it is crucial that you maintain a high rod position throughout the fight. A wild salmon's in built defence mechanisim when in danger is to dive to the bottom of the river. If your rod tip is not high enough a salmon will drown your line and therefor stand you a good chance of snagging your line on a sub surface obstruction. In addition to the importance of a high rod tip it is also crucial that you maintain enough pressure on the salmon throughout the fight. 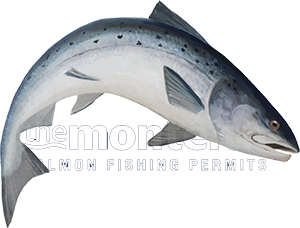 The right amount of drag pressure should keep a reasonable fighting curve on the action of the rod while still allowing the salmon to take line. Too little pressure will allow the fish far too much control and it will take forever to play the fish to a point where it can be landed. The logical and correct position on the riverbank to play a salmon is always from a 'side on' position. If you let a fish get too far below you and try to play it from there you are applying pressure to the hook hold in an 'out of mouth' direction so you'll be relying too much on the shallow flesh hook hold. You will also be playing the weight of the river so this scenario will often end up in disaster through too much pressure on the hook hold. If you play your salmon from a 'side on' position you'll be playing the fish and not the river. You will also gain much better control of the fish and the fight and the pressure you will be applying to the hook hold will be in an 'in to mouth' direction. Logically this should make sense and I absolutely cringe when I see videos of long extended salmon fight action from fishers who have let their fish get way downstream of them which always end up in disaster. The other important factor to remember when playing a salmon is that the harder you play a fish the harder the fish will fight back. They say play a fish hard with 'catch & release' in mind but this defies logic as a salmon will virtually kill itself or take ages to recover if it is played too hard. Take your time and eventually a salmon will naturally tire and give up control to a degree where it can easily steered to the waiting landing net. When the time comes to land the fish make sure you're already in a reasonably deep and snag free area of the pool which is out of the main current. When a salmon starts to tire it will start nose diving and showing its flanks and don't attempt to land the fish until you're well into this stage of proceedings. When the time is right the landing net should be submerged and the salmon should be finally drawn all the way over the waiting net in one steady movement before simply lifting the net.